Metal Gear Solid: Peace Walker Product Placement Explained! Oh look Mountain Dew. Wow. What's this? Pepsi Nex? In the jungle? They don't have it in the 1970s. That's so surprising! Doritos? Mountain Dew, Pepsi Nex and Doritos? Talk about fresh. 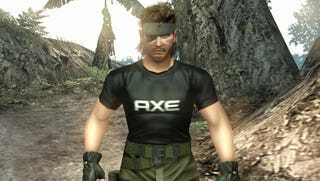 Hideo Kojima has always surprised players through gameplay, not product placement. Focus on that, no need to defend corporate marketing choices.